If you are a business owner then the customer satisfaction should be at the forefront of your mind. Whether you offer services or sell products, you will need to ensure that customers can easily get help and find answers to their most common questions. And the best way to do this is providing a support type website which is informative and can improve your customer satisfaction. This website should be capable to inform about your products and services in detail. And the captivating layout of this website can act as a cherry on the top. Keeping this in mind, we have taken a few selected Wiki WordPress themes for you through this blog. These WordPress themes can be easily applied to your website with tons of custom designs and features. 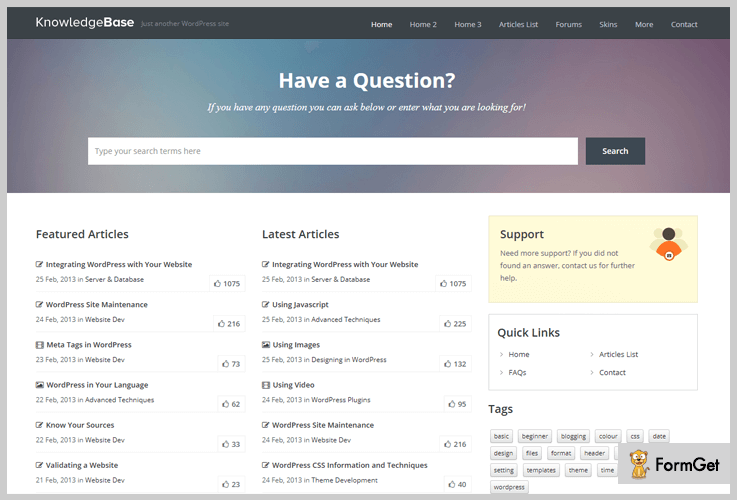 Also, these WordPress themes can be used for FAQ or support website. And we must assure you that these are enough to match your company’s branding and impress your customers with your working pattern. As I said, there are so many features in these WordPress themes, let’s talk about some of them. Responsiveness – All these themes will make your site look fantastic on all screen size. SEO supportive – These themes allows your website to run on any optimized engine. Further, this feature will also help in improving the website ranking on search engine results. Cross browser compatible – Your website will be properly rendered by all browsers. Easy installation and setup – There is no need to make a headgear about coding and all, you can make your Wiki knowledge-based website in some simple steps. Now, this was only the matter of common features in all, rather there are tons of special features in individual theme. About them, we will learn briefly in this article and quickly choose one of the best themes and make your website. But before that, would you like to focus on some of our blogs too. 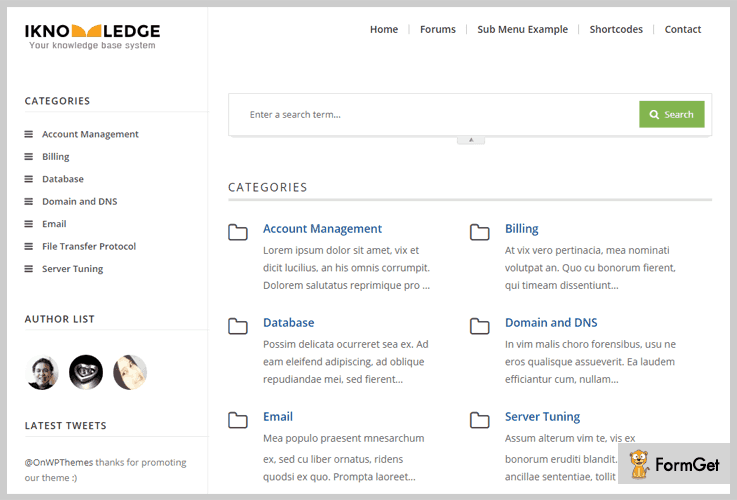 iKnowledge is a well-documented knowledge base WordPress theme. This theme comes with the simple layout and easy to use functionalities, although much capable to make an attractive website. When it comes to picking this theme for your website, you get a good set of optimization tools and features. Then there are customizer tools which include attributes such as layouts, fonts – including Google Fonts, blog area, portfolio section, series of theme colours and other appearance options. One important feature is that the theme is compatible with the bbPress plugin, so you can easily add forum segment on your support site. More useful features of this informative theme are listed below. How much will you pay for this theme? 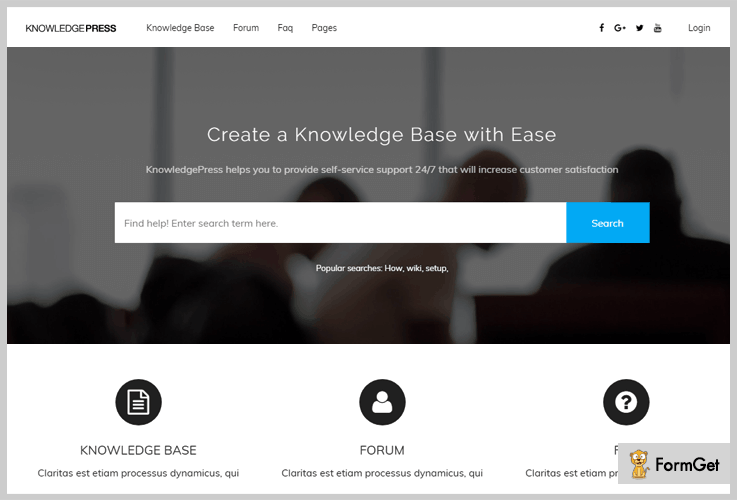 This knowledge base Wiki WordPress Theme is available at $49 with 6 months support. You have to pay $13.88 to extend your support plan for 12 months. Compatible with latest WordPress versions – You do not need to update your software frequently in this theme. This theme can support almost all of the latest versions of – WordPress 4.6.1, 4.6, 4.5.x, 4.4.2, 4.5.1 and the others. Customizable sidebar – You can keep sidebar templates on every page of your website. Also, these sidebars can be customized according to your business needs. 2 additional page template – This theme comes with 2-page template naming as – full width and archives page templates. Either you can widen the width of your page content, or display in list format through your website. Informative homepage – With the help of this theme you can give your home page the look of an informative website. Here the viewers could trace their questions to respective answers. Here you can create knowledgable categories, as well as showcase the author’s details. Also, you can put some of the recent articles here. Demo package – This theme offers you an XML file which includes the demos for easy installation. As the name suggests, this theme is specially created to build a support kind of website. This theme can furnish customer support centres, extensive FAQs, products or service documentation, internal company documentation, wiki and much more. The first effect of this Knowledgebase Wiki WordPress theme will be about the good looks with the wonderful design. It helps to make an easy layout of your website by which users can find all the important sections and the information they are looking for. Along with these, the theme supports HTML and CSS for front-end formatting and many other features are here. Let’s know about theme well. This Wiki WordPress theme comes with 24/7 support system at a reasonable pricing plan of $59. Full-width slider – This theme has a very classic slider on the homepage where you can set relevant videos or photos in the background. Along with this, the slider itself has a search text area where users can find answers to their queries. Well documented – Here, the theme has step by step documentation covering installation and setup. FAQ plugin template – This WordPress theme is integrated with FAQ(Frequently asked questions) plugin that allows you to create multiple FAQ pages on your site. It will be decorated with accordant effect. Customizable widgets – Yes, you can customize widgets as per your business needs. Like you can modify logo, upload favicon, adjust the border-radius and many more. 4 column widgetized footer area – Here, you can serve your business-related services, recent articles, social icons and whatever you want. The theme even gives you a fully widgetized footer area. If you want to increase your customer base dramatically. So, check the kind of support you provide before buying your products. But to grow your business, you anyway need a support site to showcase your business services well. It’s a fully responsive, retina ready WordPress theme with powerful features to help you customize every section of the theme easily. Also, it comes with custom widgets and supports bbPress plugin to help you add a complete forum section on your site. 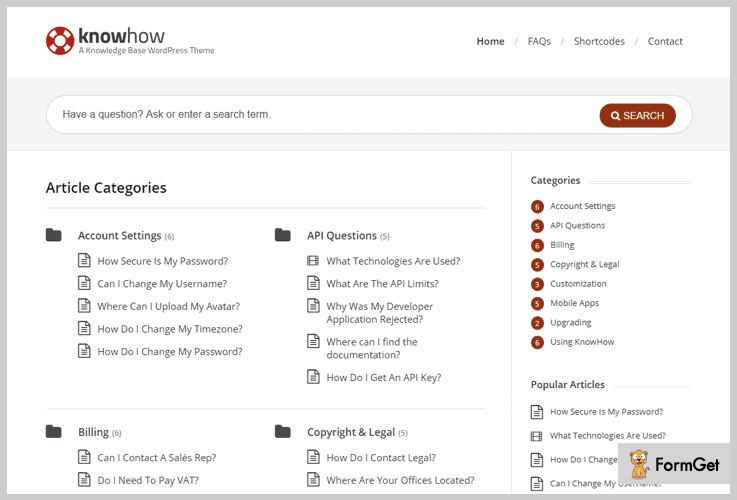 You can buy this Knowledge Base Wiki WordPress theme at a reasonable price of $49. Live search compatible – This theme has an impressive live search compatibility. Using which you can search articles, pages, topics, replies and FAQs. Homepage attributes – The homepage itself has several attributes like – widgetized sidebar, features area, latest post, content area and much more. Flawless footer area – You can get widgetized 4 column footer area in which you can put categories, latest tweets, photos and whatever you want. bbPress Plugin – As I mentioned above that, this theme helps to add a forum section on your site through this bbPress plugin. Contact page template – This theme gives you a contact page template where you can serve your contact details to your visitors. They’ve been designed to present in a visually appealing and engaging way that leaves your customers satisfied. Shortcode Widgets – A shortcode is a WordPress-specific code that lets you do nifty things with very little effort. Categorize articles – You can categorize the articles with latest and popular ones. FAQ page – You can serve the FAQ page by which you can consolidate frequently asked questions at a single page. Widgetized sidebar – You can create the widgetized sidebar on each page. Also, put widgets whatever you want, like – recent post, search pane and many more. 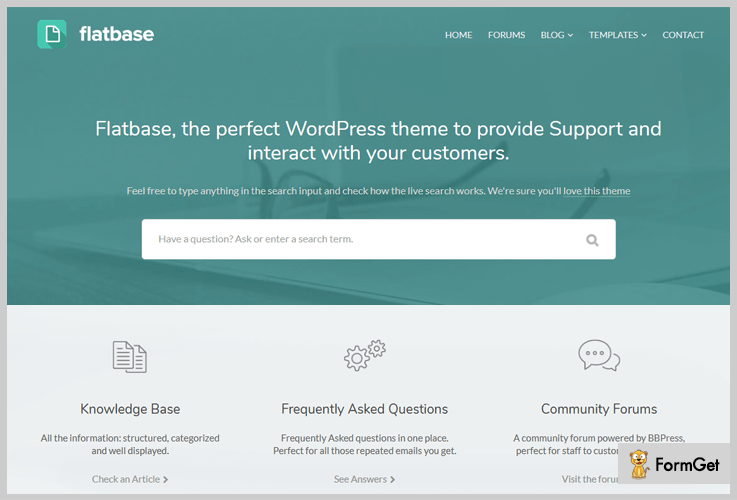 The Flatbase Wiki WordPress theme can affix beautiful features to your site. These features will helps to create a fully functioning knowledge base web platform to enhance your business. If you like to build your online support resource then this theme will be the best choice for you. This Wiki WordPress theme has a plan of $49. One click demo content – You will get 30+ demo templates and can apply to your website in just 1 click. Feature overview section – To make your customers happy, you can serve feature area section on your website. Here, you can describe your business-related services. Rating and feedback – You can provide ranking facility to your visitors for better enhancement. In this article, we helped you to find the collection of Wiki WordPress themes for several purposes. Here, we hope that the information we provided here will definitely help you to summon the prime templates for your website. Moreover, if there are things which are still not comprehensible so you can catechize through the comments section below.